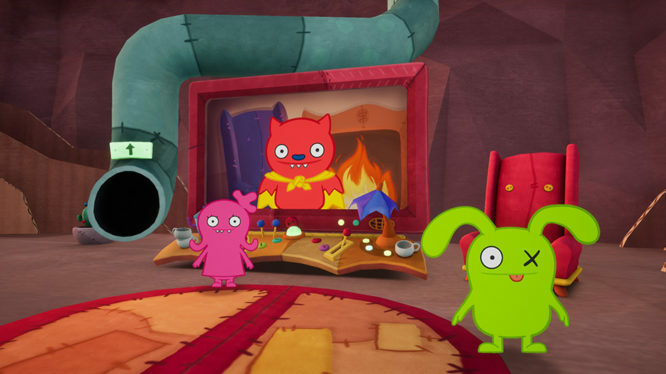 STX Films’ upcoming UglyDolls animated movie will be getting a videogame adaptation courtesy of Well Played and Outright Games. Officially titled “UglyDolls: An Imperfect Adventure”, the game is set to launch for Nintendo Switch, PS4, Xbox One, and PC on April 26th 2019. Set in the (obviously) fictional town of Uglyville, UglyDolls: An Imperfect Adventure see’s players take on the role of either Moxy or Ox as they attempt to save their neighbourhood from a horde of malfunctioning robots. The inhabitants of Uglyville embrace each others differences and are keen to see the perfectionist robots driven out of town. UglyDolls: An Imperfect Adventure promises a unique experience each time the game is played. The game features procedurally generated streets, the ability to team up with other Uglyville residence, a crafting system, and a series of unlockable areas for players to explore. Players who don’t want to go at it alone will also be able to buddy up with a friend through local co-op. Each player will be given control of either Moxy or Ox and will be able to adventure through Uglyville in a split-screen experience. UglyDolls: An Imperfect Adventure will release Nintendo Switch, PS4, Xbox One, and PC in both digital and physical formats on April 26th 2019.